This sweeping bay provides excellent fishing during the winter months during or after a rough sea. Situated at Seaham running south to Hawthorn it used to provide excellent daylight catches when the water was blackened from Dawdon Colliery, but now the colliery has gone and anglers choose night tides for better results. During the winter, cod, whiting, bass, and flatfish feature in most catches, with calm conditions providing hectic whiting sessions. A northerly or southerly blow can see codling moving inshore to feed with the chance of a double-figure fish after Christmas. Summer night tides can provide, pouting, dabs, flounders and the odd small spurdog and dogfish. The last couple of years have seen an increase in thornback rays being caught. The local’s favourite bait is undoubtedly black lugworm tipped with snake whiteworm, but blow lug, ragworm, mussel and peeler crabs will all be successful. For whiting, use multi-hook rigs with small hooks and small baits such as lug tipped with mackerel. Increase the hook size and use a Pennell rig for cod. A 13ft – 15ft beachcaster and reel loaded with 18lb mainline and leader should be good but snags can often pose a problem, especially after a rough sea. Usually a 20yd move from a snag can help. Distance casting can help in daylight, but if the sea is coloured or at night, the fish move closer to the beach. 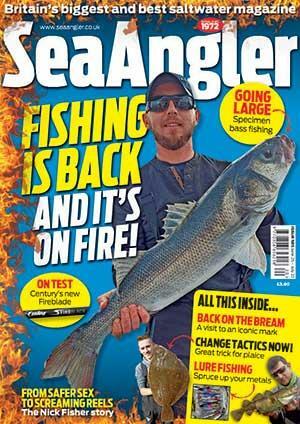 SEAHAM ANGLING SUPPLIES, 72 Church St, Seaham, tel: 0191 581 7915. Opening times: 8.30am – 5.00pm Monday to Saturday, 8.30am – 1.00pm Wednesday, Closed Sunday. Bait: Lug, rag, wrapped blacks and fresh yellowtail lug, occasionally peeler crabs plus frozen baits. COAST ROAD FISHING TACKLE, 3 Sunderland Rd, Horden, tel: 0191 5180742. Opening times: Monday to Saturday 9am – 5pm, Sunday 9am – noon. Bait: Live ragworms, lugworms, razorfish and runnidown lug (when available), plus frozen baits.